I am a stickler for traditions – especially around the holidays and especially in regards to food. Thanksgiving wouldn’t be the same without brown sugar, pecan crusted, butter laden sweet potato casserole or stuffing made with Mrs. Cubbison’s (who I always imagined was good friends with Aunt Jemima…) classic dressing mix. Every once in a while, however, a new culinary tradition is born, a recipe so good it breaks right in to the standards with fresh flavors and an addictive quality that demands repeating. This happened last year with Cranberry Cream Cheese Dip. A friend brought it to a Thanksgiving celebration and I couldn’t walk away from the plate. We ate the dip with tortilla chips and Wheat Thins. 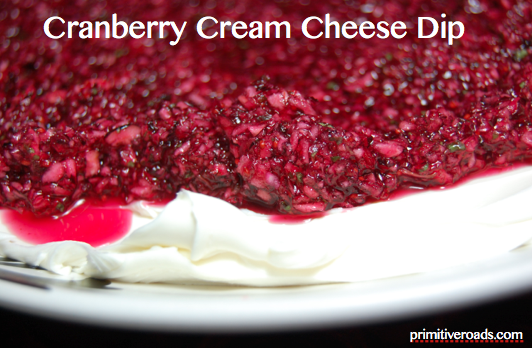 Basically, anything crispy or salty was an excellent foil for the smooth tang of cream cheese piled high with a sweet-tart cranberry relish. My fiance, now husband, and I proceeded to take this dip to every function left in the holiday season. It went from the desert to the chilly Ozarks and back home again. My mom flew to Idaho for Thanksgiving this year. 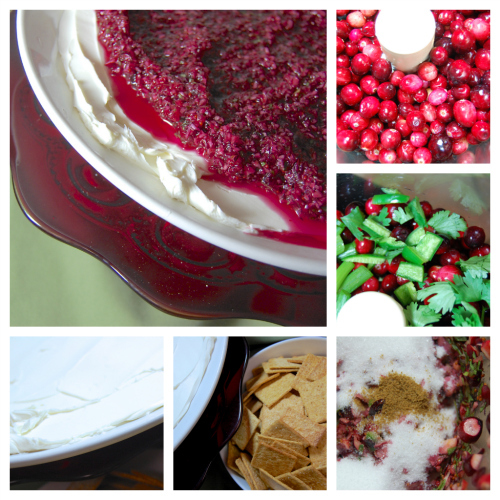 When we planned the menu, you better bet the Cranberry Cream Cheese Dip made the list for pre-meal munching. If you’re like me and forget to pick up a lemon while you’re at the grocery store, sit your little hiney back in the car and go get one. (Or have your ever so kind husband grab one on the way home from youth group even though he is dead tired – thanks, babe! When he heard what I needed it for, he agreed that the extra stop was worth it). The lemon juice, combined with the sugar, helps break down the cranberries and totally brightens up the relish. Our go to vehicle for this insanely addictive dip is Wheat Thins, but any beloved crackerish item will work. I do hope this dip finds its way into your holiday recipe repertoire! Your family and friends will love this new tradition. Original recipe by Jamie Cooks It Up! Rinse cranberries under cool water and pick out any shriveled or bad cranberries. 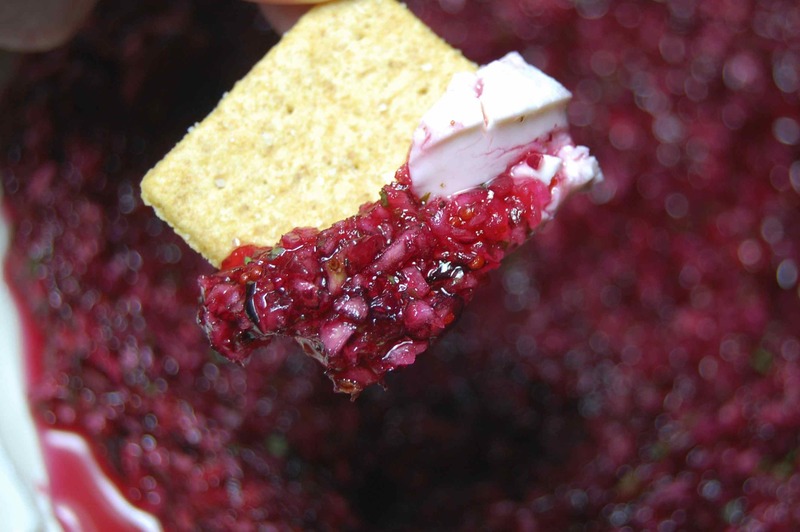 Place berries in the bowl of a food processor. I’ve chopped by hand and the results are much quicker and more cohesive when done in a food processor. I’m not one for extreme heat so I use half of the jalapeño. Take the rib and seeds out. Chop green onion, cilantro, and jalapeño into smaller pieces. Add to processor with sugar, cumin, lemon juice, and salt. Pulse mixture until the cranberries look like gravel and the other ingredients are well incorporated. Put in a bowl and chill (I vote overnight!). Let the cream cheese come to room temperature a couple hours before you’d like to serve the dip. Place the foil wrapped bricks in room temperature water for awhile to speed up the process. Use a knife or spatula (an off-set spatula, like you would use to frost a cake, works wonders here) to spread both blocks of cream cheese over a plate. 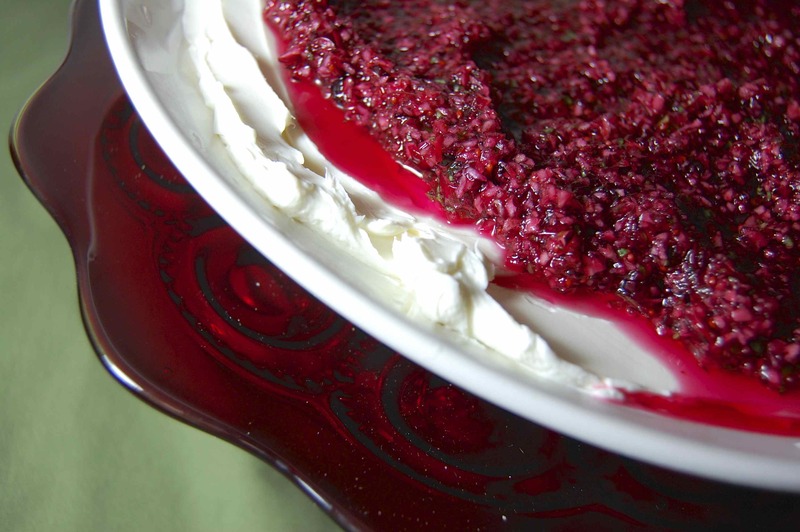 Pour cranberry mixture over the cream cheese. Serve with crackers or chips of choice. Three of us devoured half of it in one sitting and the remaining half the next day. Just put saran wrap over the plate and all is well for eating leftovers. Let me know what you think, Natasha! Oh, you must K! I think you and Carl would love it. This looks so yummy! I loved the way you not only shared the recipe but wrote about it in a way that I can almost taste it! 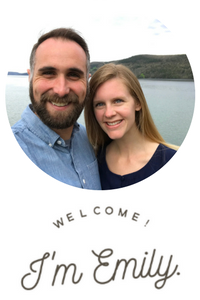 Thanks for linking up, Emily!